Today we celebrate the Feast of the Visitation, when Mary goes to visit her older cousin Elizabeth after accepting the call to carry and give birth to Jesus. Now you might be thinking: Just what does this have to do with me? Let’s look at Luke’s gospel and at the above mural of Mary and Elizabeth for answers. God called Mary for a singularly monumental task, but God didn’t expect her to go it alone. After accepting the ultimate call to action, Mary did what many of us do when we find out we’re expecting – she sought help from someone close to her, who loved her, and could relate to what she was going through. Today, we celebrate Mary’s presence of mind to go to Elizabeth. Elizabeth immediately validates Mary’s blessed pregnancy with words of encouragement. Imagine the relief Mary must have felt upon hearing Elizabeth’s confirmation of the ultimate blessing that God bestowed upon her. Elizabeth commends Mary for not only saying yes, but for believing that the yes meant everything God said it meant. Today, we celebrate the camaraderie both women shared as they carried their special babies. They couldn’t know the joys and the struggles that these two boys would bring to the world, but they could celebrate together, knowing that neither was alone. 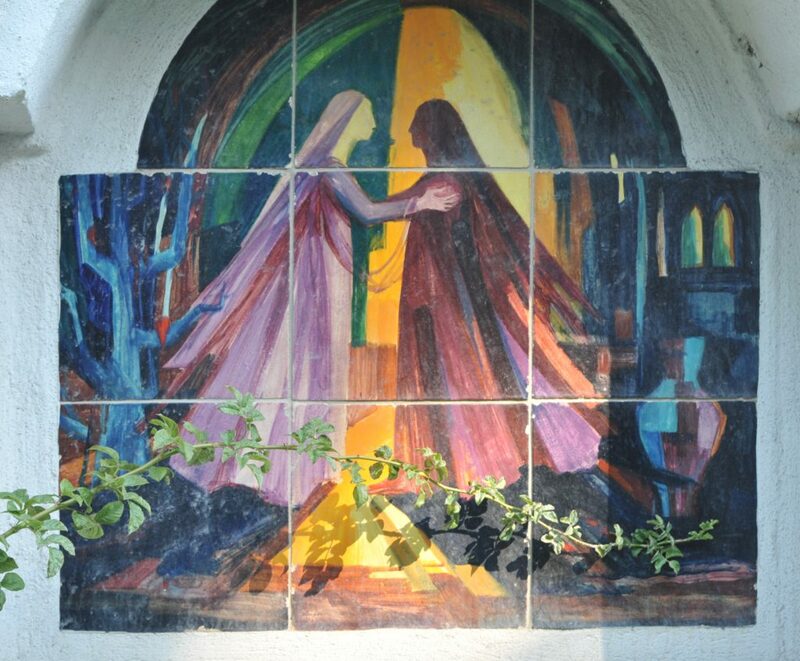 This wayside chapel mural in Austria helps me imagine the blessed exchange Mary and Elizabeth shared. The artist shows us two women embracing, one light with darkness behind her, and one darker with light shining from the background. There’s no telltale blue clothing or wrinkled face to hint at identity. These faceless women could be any women, and every woman. Study the image and find yourself there. Are you Mary? Elizabeth? Gentlemen, don’t feel left out. Are you someone baptized by John? Saved by Jesus? 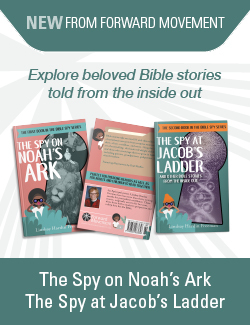 Don’t forget about Zechariah, Gabriel, David, and Joseph. Don’t see yourself? Keep looking. You’re in there. Today, we celebrate our place in the story of Mary and Elizabeth’s maternities. Imagine the comfort that the two women were to each other as their pregnancies progressed. They were each the blessing that the other needed. Think about how you felt as you journeyed toward childbirth and parenthood: excited, scared, blessed, and isolated. (Or maybe that was just me.) Did you have someone you could call on to help you figure out what was going on? I had a special friend, Joy, who was my mom’s age, and knew me since I was five years old. When I was pregnant with my oldest daughter, she offered me her insight and wisdom as a mom of three boys. She often reassured me that I wasn’t alone. Most of all, she gave me a space to rest. Like Elizabeth did for Mary, she gave my heart peace. Today, we celebrate the act of supporting each other as we honor God’s call throughout our lives. Think about where you are on your journey as a parent. Are you able to be an Elizabeth to someone who needs encouragement and support in believing that they too can answer God’s call to be the best parent they can be? Are you like Mary, working out what’s happening now and what’s to come? It doesn’t matter that God isn’t calling any of us to bear the Son of Man. Today, we celebrate the fact that Mary had the wisdom to seek help from the one person who could truly understand her. Who is your Elizabeth? Who is your Mary? Do you know anyone who needs encouragement and support on their parenting journey? How can you follow Mary and Elizabeth’s example today? Beautiful. Thank you. I shall be pondering this all day and for future days too. Yes, thanks you for these beautiful reflections. I, too, will think on them. I want to have the wisdom to seek the support I need and to give the support needed from me by someone else. I’m writing regarding this beautiful image of The Visitation, and am wondering if you would grant permission to use this as a cover for a booklet for our Catholic Church Women’s Day of Reflection …it would be for our agenda that morning. We would need to print ~150 of them. We would also like to give bookmarks with image to them as a reminder of the day.